I know I've reviewed a few other Heroic Maps' offerings before, but I don't think (at least a quick search didn't find) I've reviewed one of their larger battlemaps. The Deepwood Catacombs is one of those maps that I wanted because it is a nice small area just perfect for a planned side adventure or an impromptu dungeon delve to throw at the players when they go off in a direction you didn't expect. The map is a nice 20" x 30" and even though it is clearly written on the product's page, I was still surprised that in addition to the expected PDF I got a 300 DPI .jpeg file for virtual table top (VTT) use. Usually VTT maps are sized at 100 or 150 DPI. Including the full-sized .jpeg was a nice upgrade. The PDF is secured and, like the rest of the Heroic Maps line, is natively sized for A4 printing. I'm not a fan of the A4 sizing because it is a pain to locate A4 paper, at least where I live. Yes, I know that world-wide A4 is more popular than US Letter, but this makes it difficult to print out the map at 100% size (28mm scale) if I wanted to. I'd have rather seen the pages made based off of the A4 width and US Letter height (11 " x 8.27".....I'm not going to bother doing the math for cm). This would allow everyone to be able to print at 100%. Sure, everyone would need to print more pages, but the basic area of the map wouldn't change. You'd only use more toner/ink printing out the superfluous parts of the page (like the Heroic Maps logo). If they actually put those extra bits on a layer you could turn off, then even that wouldn't be an issue. Instead of twelve pages of maps to print out you'd have 16, or some such, but the only extra cost would be a few sheets of paper. I'm not trying to harp on this page size thing here, but I feel I must. The 1st page of the PDF has sizing instructions stating that for 25mm scale, which is quite common, you need to print the page at 91% size. This is easy enough to do with Adobe Acrobat, but...and this is a huge but....an A4 page resized to 91% still gives a page height of 10.63 inches. Most printers need a good quarter inch of margin for printing, which means you'd only get 10.50 inches printed. Most of the pages have some extra space at the top and bottom, but the rest of the pages have needed content butting up against the top or bottom of the page. This means you are going to lose some of the map if you print this out at home. Heck, you are pretty much guaranteed to lose some of the map even if you have A4 paper and are trying to print at 100%. I really don't see any good way of printing this other than using A4 paper and printing it at 91%. I'd have also liked to see a version without the surrounding rock, but that is super nit-picky and if it was something I really needed I could just do that in Photoshop since I have a full-sized .jpeg. Personally I think this map is best suited for VTT use, and it is the reason I picked it up. Because I could tweak things in Photoshop I could take what Heroic Maps has listed as a "Hidden Tomb" and actually hide it. I'm used to seeing no doors on their maps, but The Deepwood Catacombs has seven doors already on the map, and they are all open. Overall I like this map even though there are a few things I'd like to see tweaked. 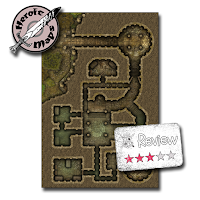 $4.50 isn't a bad price for such a large map and the fact you get it in two versions is pretty good, but there are some glaring sizing issues with The Deepwood Catacombs PDF. 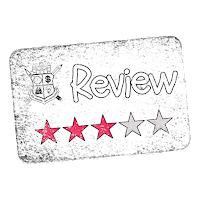 Not being able to print properly is a good 2 star ding from me....and after my initial glance-through I assumed this would be a 5 star product. Hopefully this can be addressed and an updated PDF file sent out to those who picked this up.